Mixed Native Hedging. Hedging Plants, Trees, Shrubs and Conifers. 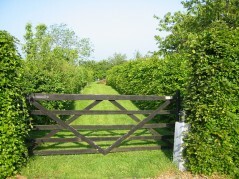 Mixed native hedges are a common sight in the British countryside and are part of our rich heritage. They provide a rich habitat for many wild creatures which are beneficial. Even if you only have a relatively small garden a native hedge can look very attractive, especially if you back onto open fields. A native hedge can be kept to a formal shape if clipped regularly, or it can be left to have a wilder look. However cared for, the fact that it is a mixture of plants gives it plenty of interest at different times of the year. We will select a mixture of native species normally found in established country hedges. Bare Rooted Seedlings: About half the mixture will be 2-3ft (60-90cm) seedling Quickthorn and the balance selected from 2-3ft (60-90cm) seedling Blackthorn, Field Maple and Spindle, and 16-24ins (40-60cm) Dog Rose, Dogwood, Guelder Rose, Hazel and Sweet Briar Rose. Occasionally, we may substitute 2-3ft (60-90cm), Alder Buckthorn, Alder Common,and 1.5-2ft (45-60cm) Wayfaring Tree, or other native hedging plants. Bare Rooted Transplants (click here for more details): the mixture will be from the following 2-3ft transplants: Quickthorn, Alder Buckthorn, Blackthorn, Dog Rose, Dogwood, Field Maple, Hazel, Spindle and Sweet Briar Rose. Occasionally we may substitute Alder Common, Sea Buckthorn, Wild Privet or other native hedging plants. Cell Grown Plants (click here for more details), ideal for planting from April to October when bare rooted plants can't be planted. Available in packs of 10, each pack containing 5 Quickthorn, 1 Blackthorn, 1 Dog Rose, 1 Field Maple, 1 Dogwood and 1 Hazel. For every 10 yard length of hedge we recommend 25 plants (10 metres = 27 plants), giving an average planting distance of 14ins (35cm) between plants, but be guided by the planting distances listed for individual varieties.